The government of Kyrgyzstan, formed by majority coalition, just started the work, but it is already being criticized not only "in the kitchens", but also in public. The problem is in people (as always) that do not inspire confidence while separate names personify the insult over weak belief in the prosperous future of the state. Almazbek Atambaev (SDPK) is the Prime-Minister. Omurbek Babanov – first deputy Prime-Minister (Respublika), Jantoro Satybaldiev – one of the deputy Prime-Ministers (SDPK). We [MK-Asia – editorial note] already paid enough attention to these people. Therefore, let us "offer" precious newspaper space to other ministers. 2006-2009 – the press-secretary of Kurmanbek Bakiev. 2006-2010 – acting CEO of ElTR Public Television Company. 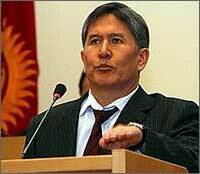 Mr. Shakiev joined Ediny Kyrgyzstan party and lost the parliamentary elections. Mr. Shakiev says he joined journalism in 1996. He was the chief editor of Obon newspaper; later on he founded Uchkun newspaper. In 1999 he became the deputy chief editor of Erkin-Too newspaper. In our opinion, he was not really competent press-secretary of the president. Besides, the number of cultural workers protests against the candidacy of Mr. Shakiev. He graduated from Frunze polytechnic institute, economics and law departments of Kyrgyz state university. In 2000 he was heading the parliamentary committee for property, privatization and licensing. 2002 – deputy Finance Minister. 2003 – the Governor of Batken Oblast. He is known for few scandalous situations, related to interpretation of billboard information. Overall, the gaps in education may be ignored. However, perhaps only Omurbek Babanov may explain what Askar Shadiev has to deal with energy sector. Perhaps, he is a perfect musician (we are not really competent to judge). He graduated from music department of Osh state pedagogical institute in 1983. He worked as concertmaster and teacher in music schools of Osh and Jalal-Abad. Mr. Junusov used to be the member of parliamentary committee for education, science, culture and information policy. As a deputy he is known as excellent performer of varied speech. He had friendly relations both with Kurmanbek Bakiev and opposition. Last week he expatiated in praise of Akhmatbek Keldibekov. This person has two degrees from Frunze polytechnic institute and Interior Ministry academy. He has been running business since 1991. Mr. Atakhanov is the head of non-state pension fund. At one of the press-conferences he shocked the public by detailed overview of pension system in the republic, saying that over half a million of citizens will not get pensions because only 32 percent of working population transfers money to Social Fund. He immediately offered good solutions. However, it is unclear how this knowledge will help him run the security agencies. Mr. Momunaliev graduated from architectural-construction technical school, Chui University and Academy of management under the President of Kyrgyz Republic. He worked in the local administrations for few years. In 2005 he joined the government’s office. In 2007 he became the deputy head of government’s office. In 2009 he was appointed as permanent representative of the government in parliament. He graduated from Frunze polytechnic institute, Kyrgyz state national university and Diplomatic academy under Kyrgyz Foreign Ministry. In six years Mr. Kazakbaev was the advisor, head of department, deputy head and head of main department of consular service. In 2005-2009 he was the Kyrgyz consul general in Istanbul. In January – October of 2009 Mr. Kazakbaev was the first deputy Foreign Minister. Since April of 2010 he is the Foreign Minister of Kyrgyzstan. He is fluent in Kyrgyz, Russian and Turkish, speaks German. The unofficial sources report his friendly ties with brother of current president. The major general of police graduated from Kyrgyz state institute of physical culture and law department of Kyrgyz state university. He was the head of Berkut team, the security officer in the criminal investigation office. In 2002 Mr. Rysaliev headed the department for investigation of serious crimes. 2002 – head of department for combating organized criminal groups. 2004 – deputy head of internal affairs department of Jalal-Abad oblast. 2010 – head of internal affairs department in Bishkek. He was appointed as Interior Minister in September of 2010. His competence in legal issues is not really known yet. Allegedly, he is brother-in-law of Ata-Jurt member Kamchibek Tashiev. In July of 2010 Roza Otunbaeva fired six judges of the Supreme Court, including Mr. Mukhamedzhanov, the member of judicial board of administrative and economic issues. At the end of 1990s he was the first deputy Finance and Economy Minister of Kyrgyzstan. He worked five years in International Monetary Fund in Washington DC. He headed the number of international projects for fiscal policy, corporate governance, regional trade, agriculture, transport and infrastructure. He can keep secrets. Samat Kylzyev (his deputy) said not long ago that "Finance Ministry has no information about money, found in the bank cells and belonging to family of Kurmanbek Bakiev". Young man (born in 1977) graduated from management department of Kyrgyz-Russian Slavonic University. He worked as insurance experts, chief expert in Finance Ministry, head of unit and department. He also held managing positions in the presidential and government’s offices. Finally, he was the deputy head of Central Agency for development, investment and innovations. There is not much information about this minister except for the fact that he used to be Board of Directors chairman at OJSC Commercial bank Kyrgyzstan. He finished Academy of management under the president. He founded Agroprodkorporacia. Recently he was the director of agribusiness competitiveness center. He believes that agricultural sector should be legalized and government should help promote agricultural export in order to increase the state budget revenues. As well as in the case with many other Ata-Jurt candidates we do not have much information about him. He used to be the head of State department for traffic safety under Interior Ministry. He graduated from St. Petersburg state technical university and Kyrgyz-Russian educational academy. He started carrier in Transport Ministry as engineer and became the deputy head of it. One of his serious proposals is to license taxi cabs that, in his opinion, will solve the safety issue for passengers. However, his arguments were not backed up with the figures. Therefore, the owners of taxi firms got it clear: licensing is another instrument of "comparatively transparent expropriation of money from population". He graduated from Frunze polytechnic institute. In 1991 he was CEO of Tunguch production and agricultural association. He also held managing positions at Chui oblast department for food and processing industry, JSC Bishkek meat plant. 2002-2004 – CEO of Kyrgyzalco. In 2005 Mr. Esenamanov was elected to the parliament where he headed the committee for development sectoral economy, entrepreneurship and use of natural resources. He graduated from Kyrgyz state university (the department of Russian philology). Mr. Sadykov earned PhD in Philology in 1991. He taught Russian language and literature and was the dean in few universities in Bishkek. Kanat Sadykov is the author of over 30 scientific and methodic articles on folklore, cultural anthropology and innovative technologies of learning. Mr. Sadykov was appointed as Education Minister in June. We have no doubts about the competence of this person, doctor of medical science, professor, member of National Academy of science. He finished Kyrgyz state medical institute. Mr. Djumabekov won several prestigious local and international awards. He published 205 scientific articles. He is the expert in the field of microsurgery, spine and limb lengthening. Many people envy his fantastic promotion: during election campaign he was listed as "head of department in Jogorku Kenesh". This person is not widely known. In 2006 Kurmanbek Bakiev appointed him as the mayor of Jalal-Abad. He was also the mayor of Tash-Kumyr (Jalal-Abad Oblast). He was badly injured during April revolution. Mr. Alymkulov says he is the representative of Russian TMK Corporation in Kyrgyzstan, Tajikistan and Afghanistan. TMK (Pipeline metallurgical corporation) is the big holding company that produces over 40 percent of domestic pipes. He graduated from Frunze polytechnic institute and law department of Kyrgyz state university. 1997-2000 - senior inspector of tax department in Osh. Later on he became the Ombudsman for Osh Oblast. In 2005, as the deputy of the parliament he worked as deputy chairman of committee for constitutional legislation, state, legal and judicial reform and human rights). This is hard to link Mr. Zhamaldinov’s past experience in tax authorities to water management and reclamation. According to presidential decree Abibila Kudaiberdiev became the Defense Minister and Keneshbek Dushebaev was appointed as head of State service for national security. Prepared by Elena Ageeva. Full version was published at MK Asia on December 22.